Karunguzhi in Kanchipuram district in north Tamil Nadu is one of 7,000 small towns in India where houses are not connected to an underground sewage network, and are entirely dependent on what are called ‘on-site sanitation systems’, such as septic tanks and twin pits to collect toilet waste. More than 500 of these non-sewered towns are in Tamil Nadu. Moreover, portions of even large towns and big cities with underground sewerage networks remain off the network, even in affluent parts of cities, such as Chennai’s techie suburbs. Until a year ago, untreated toilet waste from the around 1,500 houses in Karunguzhi was directly discharged into undesignated areas. Today, the toilet waste is collected and transported through mechanised cesspool vehicles to Karunguzhi’s new Faecal Sludge Treatment Plant (FSTP), built at a cost of Rs 4.93 crore in 2017. An FSTP is especially designed to treat waste generated outside the underground sewage network. Karunguzhi is the first town in Tamil Nadu and one of the first in India to build an FSTP (the first was built as late as 2015 in Devanahalli, near Bengaluru in south Karnataka). Karunguzhi, consequently, is one of the first towns in India to move towards the ‘full cycle of sanitation’, i.e., access to toilets, safe containment, conveyance (through the sewer network or through trucks), and finally treatment and disposal of toilet waste. While access to toilets is a much publicised issue, there is inadequate focus on overall sanitation management, including the key issue of toilet waste disposal. Karunguzhi, however, is an example of how some states are starting to get it right. The Government of Tamil Nadu, along with the Tamil Nadu Urban Sanitation Support Programme (TNUSSP) supported by the Indian Institute for Human Settlements (IIHS) in Bengaluru, has begun taking steps towards managing and treating waste from on-site sanitation systems. This is crucial because in India, an estimated 47% of urban households depend on these on-site systems, according to the ministry of urban development’s National Policy on Faecal Sludge and Septage Management, 2017 (NPFSSM). In Tamil Nadu, the number is even higher, with 55% of households using on-site systems, according to government figures. Expensive to build and operate, centralised underground systems are built, managed and maintained by government agencies. They require extensive underground piping, continuous power supply, rigorous maintenance and large quantities of energy to pump in large quantities of water to households on the network. The wastewater generated is then carried in underground pipes through a series of pumping stations to a sewage treatment plant (STP), usually located at a city’s periphery. On-site sanitation systems, on the other hand, do not follow a centralised system and are built independently by house owners in consultation with masons. The design is based on the owner’s budget and space available, rather than adherence to standards and safety norms. The house owners are also responsible for bearing the cost of cleaning these systems regularly. Untreated waste from these on-site systems often goes into undesignated areas like open drains, water bodies and empty land, leading to hazards such as groundwater pollution and faecal contamination of the water supply. Around 62.5% of toilet waste in urban India is untreated or partially treated, and a major part of this waste is from on-site systems, according to the NPFSSM 2017. In view of the high cost, infrastructure and energy requirements of expanding the underground sewage system, the NPFSSM 2017 recognises that it is unlikely to reach all the over 7,000 non-sewered towns in the near future. Thus, at least until complete coverage of underground sewage is established, management of toilet waste from on-site systems is a key step towards sustainable sanitation and meeting the Swachh Bharat Mission goals. Ideally, in on-site systems, toilet waste collected in septic tanks or pit latrines should be regularly ‘de-sludged’ and mechanically emptied by ‘cesspool vehicles’. These vehicles should then carry the waste either to dedicated FSTPs, or to STPs where they can be treated along with underground sewage. Karunguzhi’s FSTP now receives around 6,000 to 8,000 litres of waste daily from Karunguzhi and the neighbouring town of Madhuranthagam, which has 10,000 households. This is roughly equivalent to the waste generated by one household over a period of four years. This waste then undergoes four stages of treatment for safe disposal or reuse–key to preventing further pollution of water bodies and spread of diseases from contaminated water. During treatment, the solid and liquid waste is separated, and the liquid undergoes natural filtration using plant beds and gravel, after which it moves to a maturation pond. 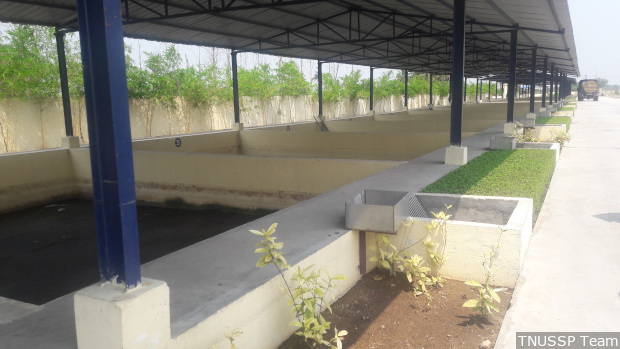 Once the water is treated, it is safe for disposal or reuse for irrigation purposes, and is presently being used inside Karunguzhi’s FSTP campus for that purpose. The solid waste undergoes separate treatment, creating a form of manure free of foul odour and toxins, which can be used as a fertilizer. The sludge drying bed at the Karunguzhi Faecal Sludge Treatment Plant. The plant receives 6,000 to 8,000 litres of waste daily from Karunguzhi and the neighbouring town of Madhuranthagam. Another issue is that households tend to empty their septic tanks only once they are completely full and give out a foul odour, due to a lack of awareness that infrequent desludging can lead to sludge overflow, pollution and health risks. 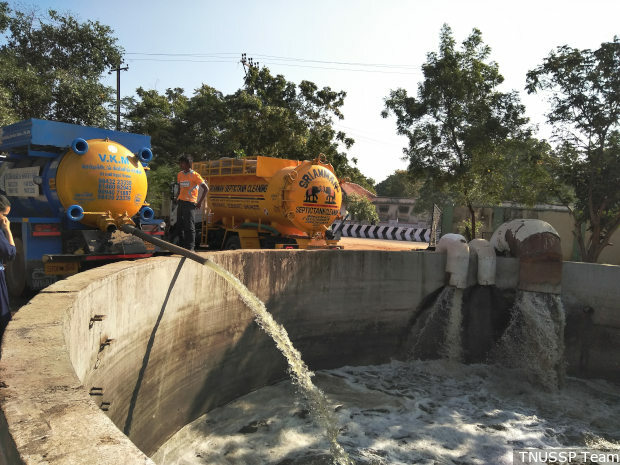 To regulate this process and ensure waste from septic tanks safely reaches the FSTP for treatment, TNUSSP and the state government are exploring methods like automated SMS reminders and a desludging app. The app creates an automated desludging calendar for each household, and allows the Town Panchayat to access its data and communicate the date and frequency of desludging to households. There is also a fixed cost of Rs 1,500 for collection which households pay to the Town Panchayat, which then despatches collection vehicles. Using private and non-standardised processes could end up costing much more–up to Rs 5,000. In June 2018, the Tamil Nadu Government sanctioned Rs 217 crore to build another 49 FSTPs across the state; construction has already begun. These FSTPs will be an important link in the chain of ‘muzhu sugadharam’, or full sanitation. 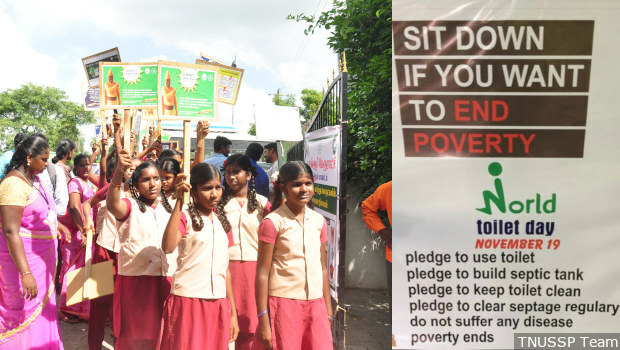 Karunguzhi marked World Toilet Day on November 19, 2018, with rallies and posters that spoke not only of ending open defecation and building toilets, but also about building and maintaining septic tanks. Besides building FSTPs in towns with no sewage treatment facilities at all, Tamil Nadu is also using the ‘co-treatment’ method in places where STPs already exist. Here, waste from on-site sanitation systems is treated along with waste from the underground sewage system, capitalising on existing infrastructure, making it more cost-effective. While building a dedicated FSTP requires a capital investment of Rs 3 crore or more, depending on capacity, retrofitting existing infrastructure for co-treatment can cost between Rs 5-15 lakh. Currently, this is already being practiced in several urban local bodies (ULBs) in Tamil Nadu, and is feasible in many more, a fact that has also been recognised in the faecal sludge management resource book of the Swachh Bharat Mission. In the ‘co-treatment’ process, waste from on-site systems is collected by cesspool vehicles and added to underground sewage before it is treated, either directly at the nearest STP or at predetermined pumping stations retrofitted with suitable infrastructure. This method is feasible in places where STPs are being underutilised and have spare capacity. STPs are usually built according to population projections and also assuming that the entire city is sewered, and hence likely to have spare capacity. Tamil Nadu now has 51 STPs which do not operate at full capacity. Equipped to treat 1,280 million litres daily, they receive and treat only around 769 million litres. For example, an STP at Panjapur in Tiruchirapalli where co-treatment is being carried out has a capacity of 58 million litres per day, and currently receives between 40 and 50 million litres a day from the underground sewage system. While the spare capacity here may not seem huge (some STPs like those in Coimbatore and Cuddalore function at just 25% and 7% capacity, respectively), it is sufficient for receiving waste from the on-site systems, which generate a lower volume of waste everyday. In Tiruchirapalli, waste from on-site systems collected in four surrounding pumping stations amounts to 480,000 litres a day (equivalent to 80 sewage trucks), far less than the spare capacity available. Tankers emptying sludge into a collection well at a pumping station in Tiruchirappalli for co-treatment. This method is already being used in at least 26 of 35 ULBs which have functioning STPs, according to surveys conducted by ULBs in Tamil Nadu, along with TNUSSP and IIHS, and is feasible in many more places across the state. Source: Survey by urban local bodies, Tamil Nadu Urban Sanitation Support Programme and Indian Institute of Human Settlements, 2018. Both FSTPs and cost-effective methods like co-treatment can thus become efficient on-site sanitation management systems to deal with India’s mounting sewage crisis. Besides providing such infrastructure, government efforts to inform and involve the public more–especially Resident Welfare Associations, self-help groups and households using septic tanks–will go a long way towards recognising that the cycle of sanitation does not end with flushing a toilet. Previous Post: Meet This 27 Year-Old Man Who’s Behind The Amalgamation Of Women Empowerment And Environment. Next Post: 97 Ganga towns to be declared open-defecation free by March: Hardeep Singh Puri.